It was the dawn of the 80s, and we were hard-rockin’ renegades, living life in the fast lane on the edges of the Los Angeles music scene. We were young – I was sixteen when we started – but worldly: we were L.A. girls after all. Yes, we’d seen and heard it all, unlike those pathetic teenage runaways on Hollywood Boulevard who came to town corn-fed and starry-eyed and ended up strung-out, destitute, and disillusioned. We knew better. WE were going to be famous! In those days, we never stopped doing it. There were eight of us: Suzanne played drums, Kentia, Maria, and/or Mark played guitar, Sandy and Sue played keyboards, Judy and Michelle provided vocals, and I played bass. Another girl, Dana, was our permanent stage hand -- she already had both a drivers’ license and free use of her dad’s van, both of which were essential to our existence as a functioning band. We rehearsed for several hours every weekday afternoon, and sometimes on weekends. I heard our songs in my sleep and tapped their rhythms with my fingers as I ate or studied or watched TV. I grew thick, ladybug-shaped callouses on my fingertips from the ridged metal strings of my electric bass. I could hook that bass up to my amp and troubleshoot said amp with my eyes closed. Performances, of course, were what we lived for. We didn’t get too many calls for paid gigs, but when we did, boy did it feel sweet. Never mind that they weren’t in the most prestigious of venues – in time, we knew we’d be on regular rotation at the Troubadour or the Roxy or some other Sunset Strip hotspot where a talent scout from a record label would certainly discover us – but, as Mark said, we were still paying our dues. So off we went to our humble gigs. There was the charity fundraiser in the parish hall at Christ the King. And the dinner meeting of area Catholic school principals at Notre Dame High School, an especially tough crowd. (We played only mellow instrumentals for them.) But no matter who we played for, we gave them our all – that was part of the game plan too, according to Mark. Every performance, he said, has to be your best if you wanted to make the big time. And someday we’d be able to look back and laugh about those evenings playing half-amplified Doobie Brothers and Pat Benetar covers (had to be considerate of the neighbors!) for venues filled with nuns and squealing children. It wasn’t ideal, but it was a necessary part of our journey. Besides, we had no choice. Yes, we were rockers at heart, destined for stardom. But officially, we only existed for four units of fine arts credit towards our graduation. And what serious club would listen to an audition tape from an outfit officially called the Immaculate Heart High School Contemporary Band? Mark’s hands were tied. His rock’ n’ roll dreams burned even more brightly than ours, but he couldn’t afford to lose his day job as the school’s music teacher. And because we didn’t want to lose the coolest teacher in the school, we dutifully limited ourselves to our school-sanctioned gigs. But after our performances, we allowed our dreams to take full flight. Somehow, no matter where we had performed in town, we always ended up at the same place for dinner afterwards: Tommy’s, a beat-up hamburger joint in a seedy neighborhood close to downtown. It was cheap, open late, famous (or infamous, depending on whom you ask) for the distinctive, gut-busting chili that came with every burger, and best of all from our perspective, known to attract a racy crowd of night owls, especially musicians. In short, it was a de facto industry canteen for strivers, and we considered ourselves card-carrying members of this club. Forget boys or horses or whatever other stuff the other girls at school were into: nothing felt better to my 16-year-old self than biting down into a sloppy, shamelessly greasy Tommy’s burger late on a Saturday night, chili dripping down my arms and bass lines still pounding in my head. It was the taste of dreams come to fruition: I’ve just been paid to rock my heart out, and my music paid for this burger! With five bucks left over! And Mom and Dad said I’d never make money in music! I savored every savory, goopy bite, every word of our fantastical banter about record contracts and auditions and tours. I knew there would never be another time like this in my life, and I was right. For a short while, Tommy’s oh-so-dangerous burgers weren’t the only thing that rocked in our ordinary Catholic schoolgirl lives. We did, too. Tommy’s burgers have been a favorite late-night post-party alcohol mop for Angelenos since the 1940s. The recipe for Tommy’s chili – an object of passionate craving and even more passionate revulsion – remains a closely guarded secret. Whatever’s in it, it probably won’t win any Texas chili competitions: it is clearly intended to be used as a condiment, rather than eaten as a dish by itself. It has a distinctively thick, gravy-like texture, and while it tastes distinctively of beef and chiles, it contains neither sizable pieces of meat nor any discernible chile heat (at least not to me -- but some people do go on about how spicy it is). Those who have attempted to back-engineer the mysterious condiment (there are many) are mostly in consensus that it involves a roux of flour deeply browned in fat, preferably beef fat. But some have suggested that the distinctly smooth, thick texture comes from boiling the ground meat in the sauce base to cook it, rather than browning it -- this will cause it to cook into a thick paste, rather than into distinct little meaty granules. I’ve decided to split the difference and use both techniques: a dark roux based on rendered fat from the cooked meat (there should be a lot of it; this isn’t a diet recipe), as well as additional ground meat simmered into submission in the dark, chili-scented sauce. Some recipes call for dried onion flakes, garlic powder, and even industrial beef patties to replicate that deliciously sleazy, fast-food taste. Others, however, point out that none of these things probably existed when Tommy’s first opened, so couldn’t have been part of the original recipe. Since I don’t keep those things around the house, I used fresh onions and garlic, as well as freshly ground beef – but as most recipes suggested, I used the fattiest, cheapest fresh ground beef I could find. I won’t pretend that my version can pass for the original – it can’t, and I’m sure nothing can. (Tommy’s is now a small chain in the Los Angeles area; my husband and I agree that a Tommy’s burger only tastes truly right when eaten in a dangerous neighborhood after 10 p.m.) Instead, I think of my take on that chili the way I now think of my girlhood covers of those Doobie Brothers songs – a competent, agreeable, slightly more wholesome tribute to the original. 1.Divide the beef in half. Heat the oil over medium-high heat in a large, heavy pot and add half the ground beef, breaking it up as you do so. Cook, stirring constantly, until the meat is brown and crumbly and no pink remains. Transfer the cooked meat to a bowl with a slotted spoon, leaving any juices and rendered fat in the pot. 2. Add the flour to the fat and juice in the pot and cook on medium high heat, stirring constantly, until the mixture turns a pale tan. Add the onions and continue to cook until the mixture turns reddish-brown. Quickly stir in the garlic and spices and cook for about a minute more, until the garlic releases its scent. 3. Add the broth and whisk until the flour mixture dissolves. Stir in the cooked beef, then the raw beef, breaking it up as you go. 4. Simmer over medium heat, stirring occasionally, until the mixture thickens and reduces. When done, it should be thick enough to coat a spoon. Taste and add salt if needed (both my beef broth and chili powder contained salt, so I didn’t need any more -- so be sure to taste your chili before salting it). 5. 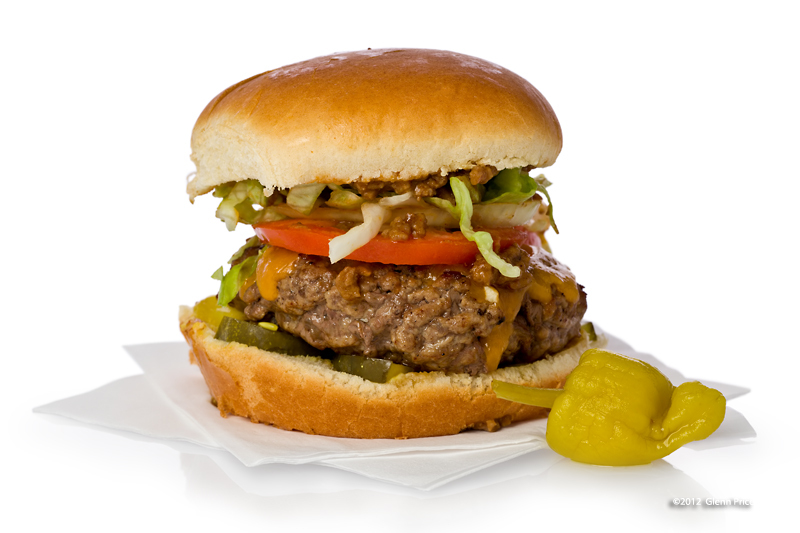 Serve over cheeseburgers, hot dogs, or fries, preferably late at night in a suspect neighborhood, with good friends nearby to share the evening. This post is part of the monthly, Twitter-based #letslunch series: on the first (or sometimes second) Friday of every month, LetsLunchers blog about a dish or their choice based on a given theme. This month's theme is music. At least I hope it is! Cathy at Slow Food Chef on Southern chicken and dumplings, inspired by Roxie Waller. Rashda at Hot Curries & Cold Beer on "Besame Mucho", banana bread, and memories of her father. Patrick G. Lee on what (not) to eat during an organ concert. Rebecca at Grongar Blog on traditional Jewish kishka and a song inspired by it. That's an amazing piece of burger! I think I will make one but make out extra hot. Wow, what an amazing post! Loved the insight into Angelenos & the heart of a musician. Your words transported me to Tommy's. Mark sounds like a wonderful teacher. Thanks for sharing. Angsarap -- Thanks! I think you'll like it--and hotter really is better with this one! Rashda -- Thank you for your kind words, and for your touching blog post! May your family continue to heal and thrive. Wow! I'm completely impressed with everything about this post. I set out to find a copycat recipe for Tommy's Chili and it seems you've done the same research as me, because you sum-up the options up well before your recipe. I usually create a variation of what sounds best, but it seems you've already done that. I'll be following your recipe, with the suggested extra spice. Thanks for making it easier for me -- And I'll most likely be posting about it on Nibbles of Tidbits with a link back to you, but certainly can't tell a better story than yours. Shelly--Thanks for coming by! Good to see another LA/OC girl here (I'm not there anymore, but I lived in Costa Mesa for 10 years). Hope you enjoy the recipe!